Kevin Smith enhanced data management at Boston Housing Authority and, in doing so, identified several energy-saving solutions. Having hosted two previous EDF Climate Corps fellows, the Boston Housing Authority (BHA) had made great strides with energy conservation across its portfolio of more than 12,000 affordable rental units. Wanting to go further, but lacking funding and able hands, BHA brought in another EDF fellow Kevin Smith. His task was to audit the overall BHA housing stock and update the ENERGY STAR Portfolio Manager software (for benchmarking and reporting purposes). Despite obstacles such as inadequate data management and lack of up-to-date utility information, Smith and the BHA energy team audited multiple sites and developed an understanding of the different types of buildings within the BHA portfolio. After discovering that many of the buildings were heated by electric resistance baseboards, Smith and the team determined that retrofitting these units with Ductless Heat Pumps could drastically reduce electricity usage. Additionally, the cooling offered by the heat pumps could offset the use of tenant-owned window AC units, which are both inefficient and create holes in the building envelope, in summer months. 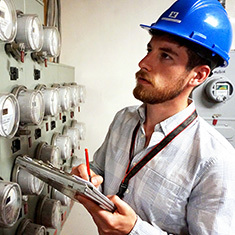 Smith and the BHA team identified large potential savings across many of the elderly developments, which, if implemented could save over 6 million kilowatt hours of electricity and $1 million annually. The retrofit of the Hassan development was proposed by Smith as a pilot project and secured full funding with utility rebates. The Hassan retrofit is projected to save over 500,000 kilowatt hours and $88,000 in utility bills each year. Kevin Smith is a Fulbright student pursuing an MA in International Relations and Environmental Policy at Boston University. His enthusiasm for sustainability developed at a young age, and his interest in energy was piqued during his undergraduate Civil Engineering program at Queen's University of Belfast - his hometown.